Oh Hi! I’m Stephanie, or more commonly referred to as Stephanie Marie. I live in New England with my girlfriend and our two furry four legged creatures called chihuahuas. But that’s not the only four legged creatures you’ll see me with. I run a pet care business where I get to take care of all sorts of four legged creatures. I love my job, and every day I strive to live a fulfilling creative life. I realized long ago that your normal 9-5’er isn’t for me. I like to try out new things and have a broad range of interests. I’m that goth girl that never quite grew out of the all black phase. My house is filled with odd collections of things from old cameras, dental molds to an obscene amount of owls. I’m pretty eclectic and try not to pigeonhole myself too much. Individuality is so fluid, you’re ever evolving and changing with each interaction you make. I’ve been an alternative model, here and there, since 2004. I love the creative process of both modeling and being behind the lens. I’m still working on carving out my own little way in this life of mine. I live through one awkward moment to the next, and have learned to laugh through the hard times. I believe everyone should live the life that best fits them. This blog is my little corner of the internet where I post my adventures, DIY projects and general tomfoolery. Thanks for stopping by! If you’d like to subscribe to my blog, click on the button to the right that says Follow Marie, Oh Marie! To follow me on Bloglovin, find me here! 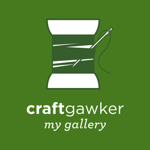 If you’d like to see some of my craft projects, find me on craftgawker here! Want more ways to keep up with me? Here’s some other places to find me. This just, hands down, probably became the best blog I’ve come across! Pingback: Salvage Love was awarded with the Liebster Blog award! The Liebster Blog award is awarded to up-and-coming blogs from other blog writers who are fans of yours.